Products focus on enhancing safety and efficiency for road users and workers. For over thirty years, Rennicks UK Ltd has specialised in delivering the latest road traffic signage and technology. Products focus on enhancing safety and efficiency for road users and workers, using new insights and expertise to offer sophisticated, innovative solutions that tackle common issues affecting our roads. Rennicks is committed to improving road safety through their fully compliant range of active studs, full colour digitally printed signs, and tri-colour mVMS. In addition, Rennicks Virtual Journey Time System also provides a first of its kind solution to the issue of journey time. Rennicks is delighted to be exhibiting at this year’s Road Expo Scotland. They have recently launched a number of new products which they are looking forward to showcasing at the show. The first is the Rennicks Off-Grid Power Solution – a hybrid, eco-friendly solution designed to provide power for a variety of roadside equipment and fixtures. Suitable for both urban and remote environments, the unit features a solar panel and wind turbine to generate clean electricity wherever it is situated. Billed as ‘the complete renewable solution’, this brand-new product promises to provide greater flexibility in off-grid locations whilst also helping companies and authorities to meet targets aimed at lowering fossil fuel energy consumption. Also created with eco credentials in mind, Rennicks have launched a wireless solar LED road stud for delineation, guidance and warning – designed to work even in areas with incredibly low light levels and harsh environmental conditions. Microcontroller technology inside each stud allows updates to control options and changes to LED sequencing post installation – the only road stud of its kind to do so. And finally, the Rennicks team will be giving live demonstrations of their new innovative mobile traffic information system – the Rennicks IVM TACTIC – a flexible, mobile traffic information system designed to offer quick and easy response to road traffic incidents. This universal unit can be fitted to any type of vehicle and is operated on-site or remotely via smartphone or tablet device for swift, safe and easy functionality. The third generation LED screen provides optimal visibility with the option to rotate 45 degrees – perfect for parking in the fend-off position and immediately creating a safe zone for the incident site. 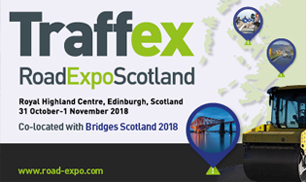 For support with your transport challenges visit Rennicks on Stand E32 at Traffex Road Expo Scotland 31st October – 1st November at the Royal Highland Centre, Edinburgh or call 01928 579 966. Book your free ticket today.